Welcome to the David Gilmour Romania. The vocalist and guitarist for Pink Floyd was born in Cambridge, London in March 6, 1946. When a teenager he went to Cambridgeshire College of Arts and Technology and met Syd Barrett and together they used to spend their lunch times playing guitar. They had spent a lot of their guitar sessions playing The Beatles tunes. Continuing as a youngster, Gilmour joined a band called Joker’s Wild during 1963 for three years and in 1966 he left had and joined a band called Bullitt which then changed to Flowers. He had spent a lot of his time playing in Spain and France with his band Flowers and two years later he received a call from Pink Floyd asking him to join them for the purpose of replacing the dysfunctional band member Syd Barrett engaged in excess drug consumptions. Gilmour started filling in for Syd’s absent days until eventually Syd became unworkable and left the band. Gilmour then permanently replaced him and then took advantage of becoming the lead guitarist and participated with the lead vocals with Roger. David Gilmour’s first marriage was to Ginger whom he had four children. Their names are Alice, Claire, Sarah and Matthew. 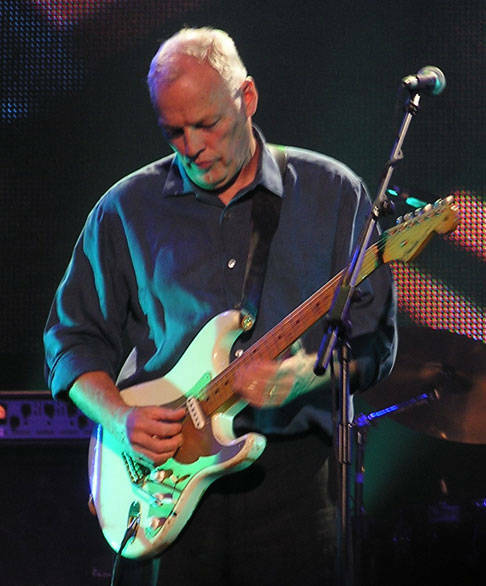 Gilmour is now married to his second wife, Polly Samson and has three children from her, Joe, Gabriel and has adopted Polly’s first born child, Charlie.What he did for Pink Floyd David Gilmour is well known for his soothing guitar sound with delicate string bends and slides that makes his playing style unique to many others. This along with his heavenly voice sound is used widely on most of the successful Pink Floyd albums in the 1970’s including the band’s biggest ever album Dark Side of the Moon. Gilmour has also produced his own solo albums as well as the Pink Floyd albums. His first one titled David Gilmour was produced in 1978 which was produced before album ‘The Wall’ was released. The second album that Gilmour produced ‘About Face’ was brought out after the ‘The Wall’ in 1984. Both of these albums were not very successful.Also, in between band duties. Gilmour has performed with many other stars such as Roy Harper, Kate Bush - whom he had founded, Grace Jones, Tom Jones, Elton John, Arcadia, Bryan Ferry, Berlin, Robert Wyatt, Paul McCartney, Sam Brown, Jools Holland, , Pete Townshend, Alan Parsons, and more His Guitar playing ability Gilmour does not play fast, instead he plays few notes with very expressive string bending, slides and double stops. I like to say it like this ‘he talks through his guitar playing’. When he was young Gilmour used to Sit listening to the radio with his guitar and attempt to play what he heard also incorporating the bass notes. He makes use of the standard riffs that all players use but play them with his own meaning. He actually said that he makes use of several musical phrases used in ‘Gone with the Wind’. David Gilmour can also play bass guitar and has very lately been playing the saxophone which is heard on one of his tracks on his new album ‘On an Island’.